Category Archive For "virtual sales training"
How would you like to get off to a fast start in sales? Joe Verde’s “Fast Start To Selling For Salespeople” on JVTN® is the virtual sales training course that gets salespeople up to speed selling cars in record time. Get a Free Demo of JVTN® by calling 1-800-445-6217. Ready to make more money? 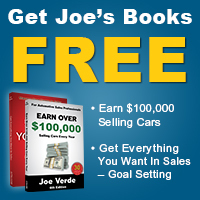 You will when you close more sales and overcome objections the Joe Verde way. “Closing The Sale & Overcoming Objections” is a virtual sales training course on JVTN®. 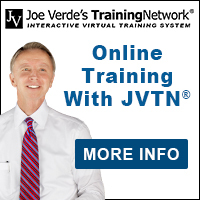 Get a free demo of the Joe Verde Training Network® by calling (800) 445-6217 today. Are you ready to double your income? Car sales training expert Joe Verde’s online series, “Double Your Income In Today’s Market,” is one of the core training courses on Joe’s virtual sales training network, JVTN®.